Trading at record levels ahead of its quarterly earnings report this afternoon, Apple is expected by Wall Street watchers to post its best June quarterly earnings ever, with nearly $25 billion in revenue on sales of 16.5 million iPhones. A total of 47 analysts polled ahead of today's earnings expect, on average, for Apple to report revenue of $24.92 billion, representing a 58.7 percent year-over-year increase. That number would also be Apple's best non-holiday quarter ever, narrowly edging the $24.67 billion the company sold in this year's March quarter. 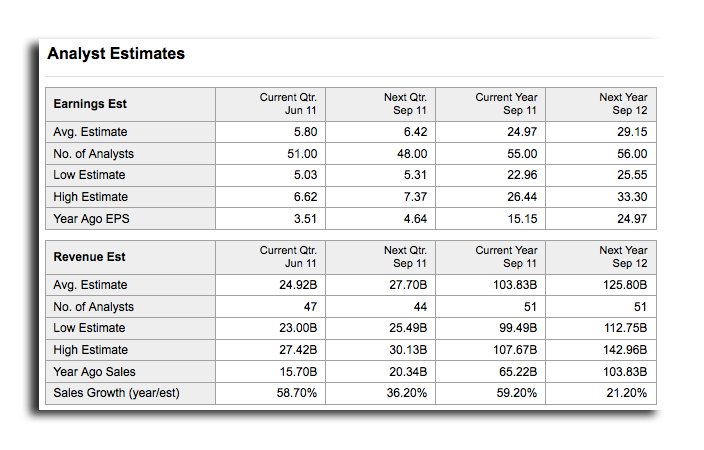 Market watchers have predicted Apple will post $5.80 earnings per share in its third quarter of fiscal 2011. On average, analysts expect Apple to report sales of around 16.5 million iPhones, according to StreetAccount data relayed by Piper Jaffray. That would be nearly double the 8.4 million iPhones the company sold in the same quarter a year ago. Analysts are also calling for Apple to sell a record 4.2 million Macs in the June quarter. That sum would best the 4.1 million Macs Apple sold in the holiday quarter of 2010. It's also projected to be a record quarter for iPad sales, as Wall Street anticipates the company announcing sales of 7.8 million units of its hot-selling touchscreen tablet. That would be a half-million units more than the previous high of 7.3 million sold in holiday 2010. Apple tipped its hand on iPad sales in early June, when the company announced at its annual Worldwide Developers Conference that total sales of the device had topped 25 million. At that pace, Apple was on track to sell more than 8 million iPads in the June quarter, though overall analyst predictions are slightly lower. Finally, the Street sees Apple reporting sales of 8.4 million iPods in the quarter. The company's June gross margins are expected to be around 39 percent. Looking forward, a total of 44 analysts polled expect Apple's September quarter to see the company reach new heights with $27.7 billion in total revenue, with $6.42 earnings per share. Total revenue for the fiscal year concluding with the September quarter is expected to top $100 billion, with the average prediction at $103.83 billion. Apple will report its earnings later today after markets close at 4 p.m. Eastern. AppleInsider will have full coverage.